College students with a background in construction management are in high demand by contractors. To expose college students to careers in specialty contracting and begin developing qualified employees to fill its management positions long-term, Western Specialty Contractors, the nation’s largest specialty contractor in masonry and concrete restoration, waterproofing and roofing, recruits candidates from leading construction management colleges and universities across the country for its comprehensive, hands-on internship program. “We believe the growth of our workforce depends on a strong internship program. If the intern enjoys their internship experience, then there is a good chance they will be receptive to long-term career opportunities within Western,” said Maria Traina, Director of Human Resources at Western Specialty Contractors. Visits to colleges and universities are typically made by a combination of senior human resources staff and Western’s branch managers who offer students a first-hand perspective into the specialty field of restoration construction and preventative waterproofing. Those students who take part in Western’s internship program have the opportunity to gain much more than traditional work experience. Over 85% of Western’s managers have been promoted from within the company. Initiative and hard work are rewarded with competitive salaries, excellent benefits including a 401K match, and tuition reimbursement, as well as advancement opportunities. Josh Woolard, a former intern at Western’s Chicago Branch, was hired by Western and is currently working as a Project Manager at Western’s Springfield, IL Branch. For Woolard, the hands-on experience he received while an intern was the most beneficial. “I didn’t want to be with a general contractor. I liked the specialized contracting. I got to look at a set of plans and figure out exactly what was going to need to happen and the best way to get it done, pleasing the customer and also helping Western. I got to go on-site. It was really interesting,” said Woolard. For Teddy Williams, gaining a well-rounded perspective of the construction business through his internship at Western helped him to determine his career path. Williams currently works in Western’s Dallas, TX Branch as an Assistant Business Development Manager. 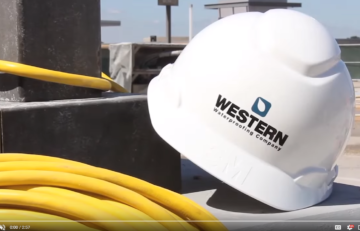 For more information about Western’s college recruiting and internship programs and current job openings, visit www.westernspecialtycontractors.com/careers/. What’s so Special About Specialty Contractors? Is Your Building or Parking Garage Prepared for Winter? Why Are Regular Building Envelope Inspections so Important? Announcements: Western Goes Live with the Viewpoint Software!